The Globemakers at the Italian design company Atmosphere depict the world like you’ve never seen before. Each globe has been spectacularly designed and crafted to bring an entirely original interpretation of the earth to your home. Working to expand the mind, these gloves also serve to remind you of the vast nature of our world. The passion behind Atmosphere lies in the belief that a globe should be displayed in every home, so they’ve applied creativity and top design skill to the art of the globe – and then added the beauty of light. The Classic B4 Physical Illuminated Globe features a highly detailed geographic map that depicts state and country boundaries, sea currents and capital cities – and when lit, will even display political boundaries. 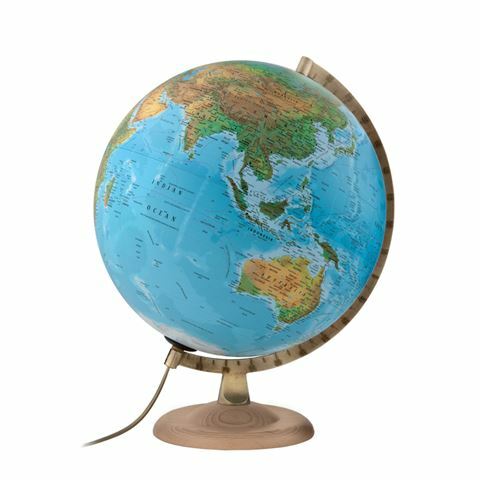 Accompanied by a metal meridian and a handy switch, this globe is both educational and an intelligent addition to your home décor. Base is made from beech wood. Meridan is crafted from die-cast metal. Accurate geographical map depicts political boundaries when iluminated. Adorned with playful images of famous sights and animals specific to each geographical location. Requires 1 x 18W halogen globe (included). Presented in an Atmosphere box. Please Note: The included plug is compatible with Australia/New Zealand electrical outlets.